Desk Phone is the backbone of communication for controlling business operations. Today's efficient managers require desk phone with elegant design, smart functionalities and multi-tasking ability as their command center. Matrix provides Business SIP Phone which meets the challenges of today's business for efficient call management and ease of use. Ergonomically designed and feature-packed SPARSH VP110 - VOIP SIP Phones increase staff productivity and enhance business communication with Easy to Use, Suitable for Mass Deployment, Secured Communication, Clear Voice and Future Ready. 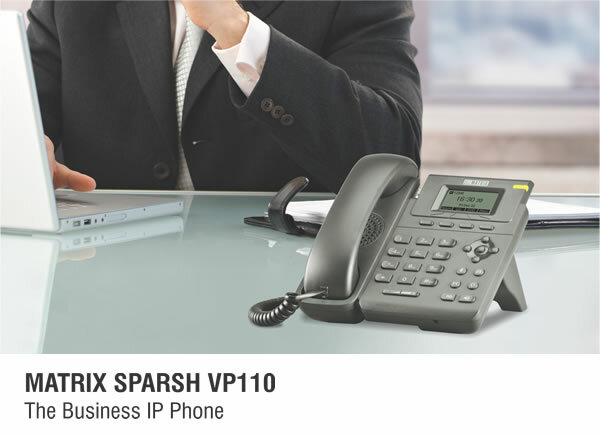 SPARSH VP110 is a new breed of entry-level SIP phone that redefines the desktop telephony experience and quality of business communications. It provides features and functions normally available in high-end phones such as Large Graphical LCD, 5-line Display, Context Sensitive Keys, Full-duplex Speaker Phone, Integrated PoE, Auto-provisioning and a broad array of Call Management features. Perfect fit for everyday users with basic communication needs, SPARSH VP110 finds its applications in call centres, enterprises, small businesses and branch offices.